Let’s delve into the basics! Understanding the technical terms surrounding jewelry can often be confusing and daunting–but it doesn’t need to be. Let’s delve into the basics of the anatomy of an engagement ring, so you can express and understand exactly what you want– or do not want–for your special ring. The head of the ring consists of multiple design elements that sit on the top of the ring’s band. It includes the centre stone and everything that holds that stone in place. This includes the collet, which is a circular rim in which the centre stone is set, and the claws. In terms of the anatomy of an engagement ring, the collet may also be referred to as the setting. 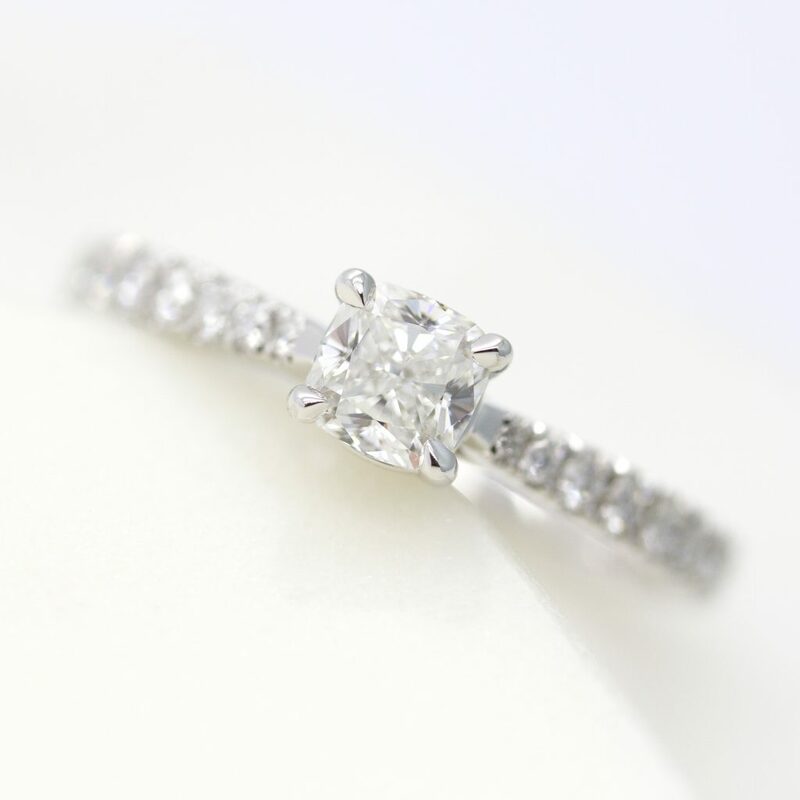 The centre stone is the featured stone on the ring and is quite literally the centerpiece of the ring design. 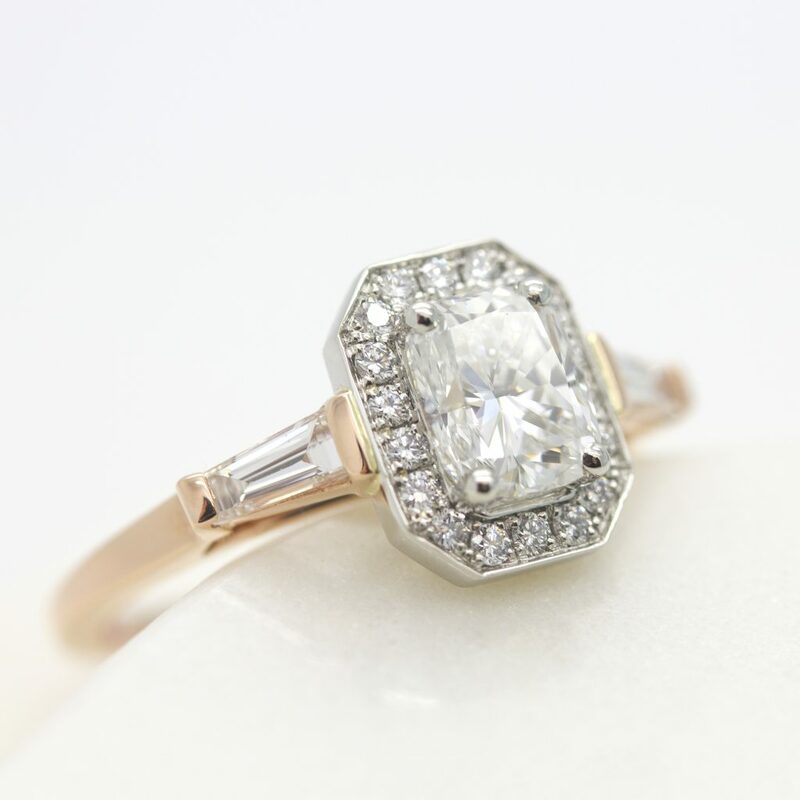 While settings such as a ‘toi et moi’ style can include more than one stone as the centre stone, highlighting a single stone is certainly the most common choice. Centre stones can be any weight for an engagement ring, ranging from 0.3 carats to in excess of 10 carats. As a general rule of thumb, they will be larger in size than side stones, for contrast. Popular centre stone choices include diamonds and coloured gemstones—including sapphires, rubies and emeralds. The claws of the ring are the small metal pieces that grip the centre stone and hold it in place. These are also known as prongs. Engagement rings generally have between four and six claws. When choosing a ring design, keep in mind the number of claws are functional, but could impact the brilliance of the stone. For example, an increased number of claws ensures the stone is securely held in place even if one is damaged; however, fewer claws allow additional light to filter into the stone, enhancing its beauty. The side stones are arranged around the centre stone, and are a perfect way to incorporate a variety of colours, shapes and styles. An engagement ring, for instance, may feature a cushion-cut ruby centre stone surrounded by round diamonds. Elaborate designs can include just one additional stone or up to 50 smaller side stones that surround or accompany the centre stone. The band is the bottom portion of the ring that curves around the finger, typically made in platinum, white gold, yellow gold or rose gold. In the United States, the band is commonly referred to as the ‘shank’. This is the part of the ring that a jeweller will adjust for ring size and the inside of the band may be inscribed or engraved with a few romantic words of your choosing. 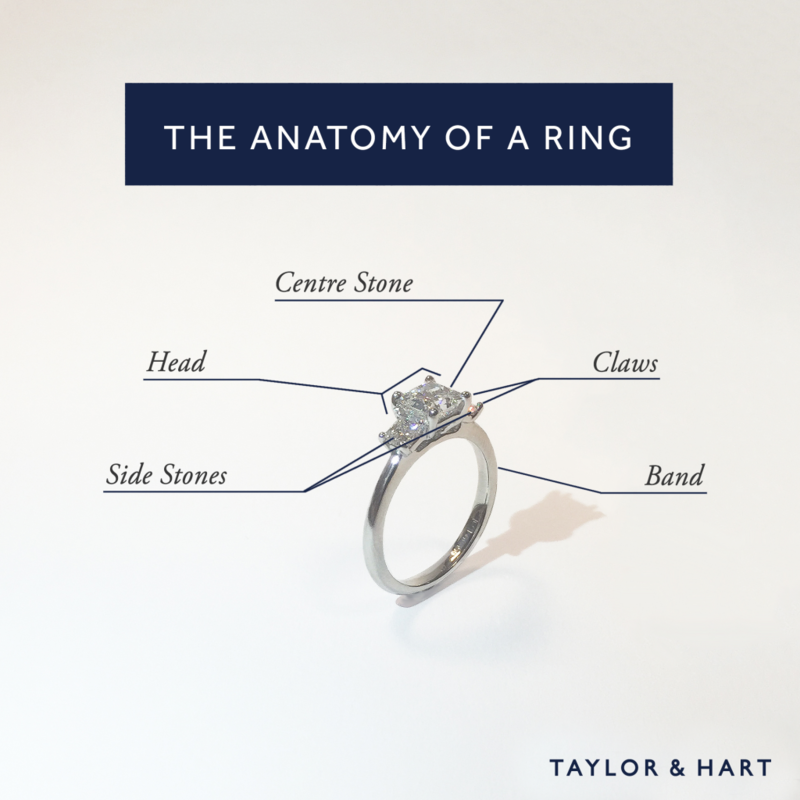 We hope this introduction to understanding the anatomy of an engagement ring has assisted you by providing the terminology you need to describe and create the ring you desire.